Hey Mark, why dont you add alternate text field for hours and minutes for keyboard lovers to be precise on first time itself instead of dragging the bar and adjust. Of course, 95% people would use this. YUI slider is keyboard accesible so it solves the purpose a bit. 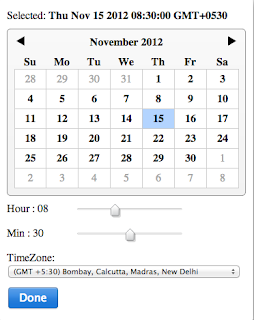 I agree with you of having a textfield to input precise time, but then there is a textfield already there which is progressively enhanced, user can also use that textfield to input precise date and time. Having troubles with this module - I'm using it in a panel, and it will only render behind the panel.. Unfortunately that didn't work as expected - do you have any other ideas? in that case i have to look at your problem separately, is it possible for you to share code or online sample?? Also, is there a way to specify date format?